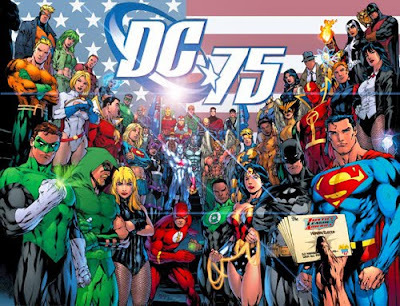 February 2010 marks the 75th birthday of DC Comics. While 75 years in business is enough of a reason to pop open a bottle of bubbly for anyone in today's economic climate, DC has done it in an industry which has had multiple crises, and even had it's doomsday predicted on more than one occasion. Throughout it all DC has battled on, and today finds itself not only in the midst of a boom in popularity, but also having spawned the likes of the trendsetting mature readers imprint Vertigo Comics, and some of the industries most seminal works, including; Watchmen, The Dark Knight Returns, Sandman and All Star Superman. From Aquaman to Zatanna, this month on IADW alongside all the usual news and events, will be celebratory posts, acknowledging the companies achievements and characters. This includes a DC 75th theme to some regular features, and the debut of a couple that I'm pretty excited about. 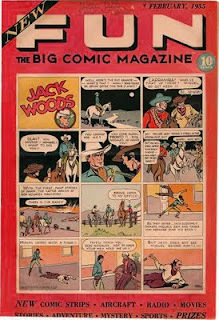 Before I let to much slip, here's a shot of the one issue that started it all New Fun: The Big Comic Magazine issue #1 from 1935. Happy birthday/month DC!